Product #45682 | SKU DRDRWEDKBV | 0.0 (no ratings yet) Thanks for your rating! The Bi-Colour Wedding Kit with 1x LED160AB and 2x LED500B Pro Lights with V-Mount Battery Plates was put together by Dracast as a 3-point lighting solution capable of AC or battery operation. 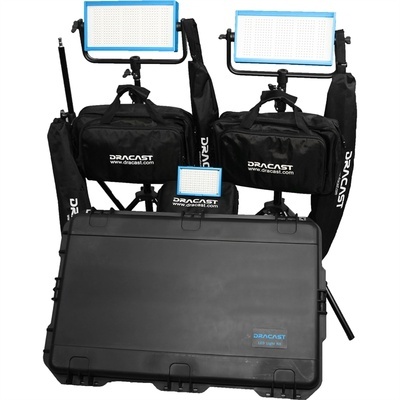 The kit includes one Bi-Colour LED160AB on-camera light with AC power and camera shoe adapter and two LED500B Pro Bi-Colour panels complete with yokes, V-Mount battery plates and multi-voltage AC power supplies. Two 6.6' light stands and a kit case for the lights are included for storage and transport. The 1/2 lb LED160AB employs 160 LEDs with a CRI rating of 95 to provide output with accurate colour reproduction. It features an aluminium chassis for strength and durability and a dimmer that adjusts the output from 0-100% without flicker as well as separate knob to vary the colour temperature from 3,200 to 5,600K. The light produces a spot 45° beam angle and employs a channel for optional diffusion gels to avoid time consuming taping. You can power the unit using the kit's AC power adapter or an optional NP-F type battery. A 1/4"-20 tap allows you to mount the light to your camera's accessory shoe via the included hot shoe adapter. At just 4.0 lb the LED500B Pro Bi-Colour LED light is an ideal choice for location work, interviews and small sets where colour accuracy, control and flicker-free output are of major importance. Variable colour temperature from 3,200K-5,600K or anywhere in between means that you can quickly match the prevailing ambient or artificial light balance with a simple twist of a knob while others are still applying filters. Dimming is equally convenient via another knob that adjusts the light intensity from 0-100% with negligible colour shift. The LED500B outputs the hot light equivalent of 500W but you won't have to be concerned about the talent's comfort - the panel runs barely warm to the touch. And the low electrical draw of just 30W means a timely return on your investment. The durable anodised aluminium frame is supported by an oversized, U-shaped yoke with locking knobs on each side and a standard 5/8" receiver. The LED500B can be used worldwide, powered by the included 100-240 VAC adapter or by optional batteries via the included V-Mount. 1x LED160AB On-Camera Light: 6 x 4 x 2"
2x LED500B Panels: 12 x 6 x 2"